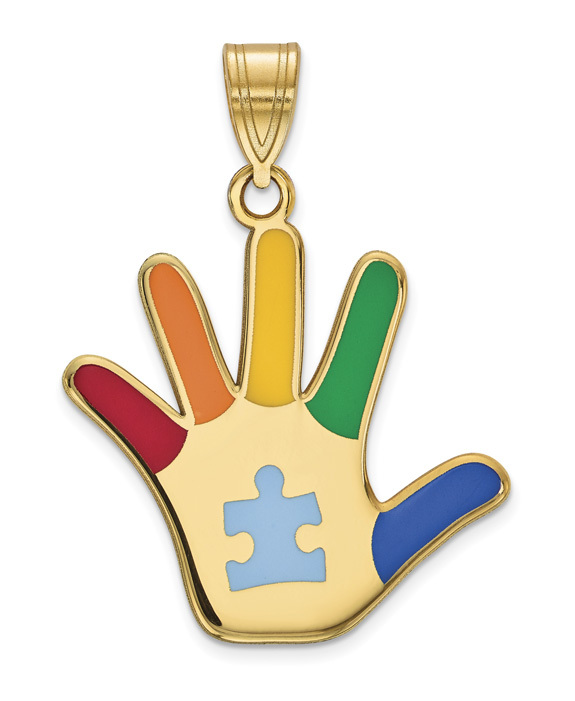 A 14k solid gold enameled autism awareness hand necklace pendant with puzzle piece. The puzzle piece is the main symbol for autism, going as far back as 1963, when Gerald Gasson, a parent and board member for the National Autistic Society, created the symbol to raise autism awareness, originally as a "puzzling condition". The hand pendant measures approx. 13/16" tall or just under 1 3/16" inclusive of the bale, which has an opening of 7mm x 3.5mm. Add a matching 0.9mm 14k solid gold box chain necklace in either 18" or 20" to match. Also available in varying designs, shown below. We guarantee our 14K Gold Enameled Autism Awareness Hand Necklace with Puzzle Piece to be high quality, authentic jewelry, as described above.